Minnie Julia Moore Stuff, born in Rushville, Illinois on August 23, 1866, attended Peoria (Illinois) Public Schools. In 1885 or 1887, she moved with her parents to Lincoln, Nebraska where she attended the University of Nebraska, although did not finish her degree. On September 8, 1890, she married Frederich Ames Stuff. Frederich Stuff later became a professor of English Language and Literature at the University of Nebraska in Lincoln, where he served a long tenure. The Stuffs had three daughters. The eldest was Freda N. Stuff Spaulding, a faculty member in the University’s School of Fine Arts for 25 years and a well-known Lincoln artist, who is also represented in MONA’s collection. 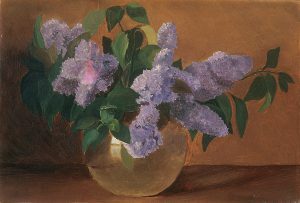 Minnie Stuff became interested in oil painting in the 1890s, and received instruction from noted Lincoln artist Clara Leland. Minnie Stuff died on December 16, 1961, in Lincoln, Nebraska. The Museum of Nebraska Art has two works by Minnie Stuff. Stuff, Marjorie Ann. Personal letter to Museum of Nebraska Art. Sep. 29, 1989.